You should have arrived here from Ilda's blog. If not, I'll attach the full blog hop list at the end of this post. Here are my cards I've created for today's blog hop! 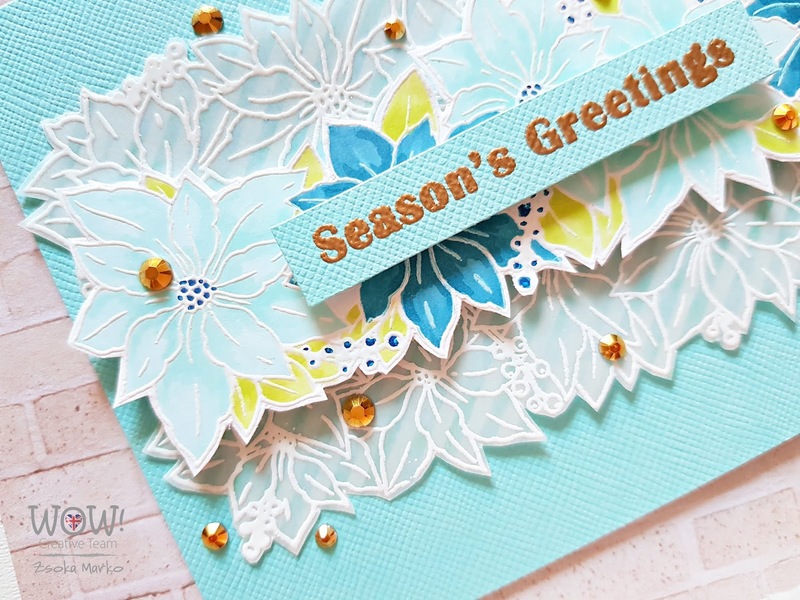 I've used the Poinsettia Trimmings stamp set from Studio Katia, Opaque Bright White and Metallic Gold Rich Pale embossing powders from WOW! I embossed the poinsettias in white, two on white card stock, two on an aqua striped vellum. I fussy cut the vellum ones and one of the card stock one, and partially fussy cut the fourth. I created two A2 size top folding card bases (landscape). I glued an A2 size white and an aqua card stock on them. I colored the card stock poinsettias with Altenew artist markers - I just did some simple coloring, I didn't feel the need to create a very detailed look here. I glued down the two vellum pieces on my aqua card front and added the card stock piece in the middle using foam adhesive. I embossed a sentiment in gold and popped it up in the middle. To finish off this card, I scattered some Gold Crystals from Studio Katia here and there. I embossed a sentiment in gold on a piece of aqua striped vellum and glued this to my white card front. Notice that the vellum is smaller than A2, maybe about 5.5x3" and I only added glue at the top which I hid under the poinsettias. I again used foam tape for the poinsettias, and adhered them down at the top (but not all the way up). I used some gold crystals on this card too. Now the fun part! Prizes yay! You can win TWO $25 CAD Gift Certificates to the Studio Katia store and 6 WOW! Embossing Powder powders of your choice along with a WOW carry case to store your powders safely in. Winners will be randomly chosen from the comments left on all the posts and announced on the WOW & Studio Katia blogs on November 27, 2018. Your next stop is Liliya's blog. Enjoy the hop! I love that you took the blue route with the holiday vibe. My personal favorite winter color combos :) Such pretty cards! Lovely cards! I really love the softness in the two blue colors for your flowers! And using the vellum also just such a perfect finish to each of the cards! So soothing, the colors on your beautiful cards !! Loved them. I love that you used the vellum in one of the cards! It looks very good! Beautiful cards! :) Love the look of the vellum. Beautiful colours on both cards & fantastic to see vellum used so h cely, thank you for inspiring. Beautiful BLUES! I love using non traditional colors for the holidays! Beautiful cards in blue shades :) Love your choice of colors and the shades! Oh wow! Awesome cards!!! Fabulous design and colouring technique!!! Love the nontraditional colors. The gold embossing and jewels really pop! So lovely and so gorgeous!!!! Beautiful color combos on your lovely cards! Love the poinsettias! Beautiful. Love the use of vellum and the colors of the flowers.